The daily bar chart pattern of S&P 500 crossed above the Fibonacci resistance zone between 2640 and 2710 (marked by grey rectangle – refer last week’s post) on Mon. Feb 4, and continued its climb along the upper Bollinger Band the next day. Strong resistance from the 200 day SMA halted further progress of the rally. The index dropped back inside the resistance zone – closing flat for the week. As long as the index remains above its 20 day SMA (middle band – marked by green dotted line), bulls will endeavour to charge past the 200 day SMA. Daily technical indicators are correcting overbought conditions, but remain in bullsih zones. MACD and RSI are moving down after facing resistances from the edges of their respective overbought zones. Slow stochastic is about to drop from its overbought zone. Some more correction or consolidation around current level is likely. On longer term weekly chart (not shown), the index closed above its three weekly EMAs for the second week in a row, but formed a ‘doji’ candlestick that often signals a reversal of direction. Weekly MACD has crossed above its signal line in bearish zone. RSI is moving sideways along its 50% level. Slow stochastic is rising towards its overbought zone. 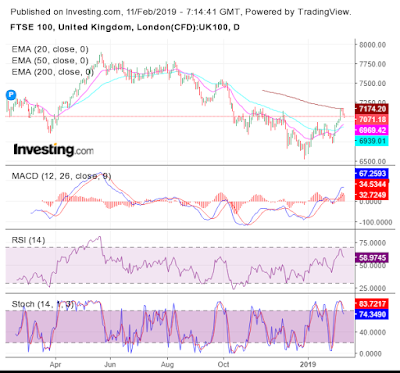 The daily bar chart pattern of FTSE 100 touched an intra-day low of 7002 on Mon. Feb 4, but soared past the 7100 level to touch an intra-day high of 7181 the next day. 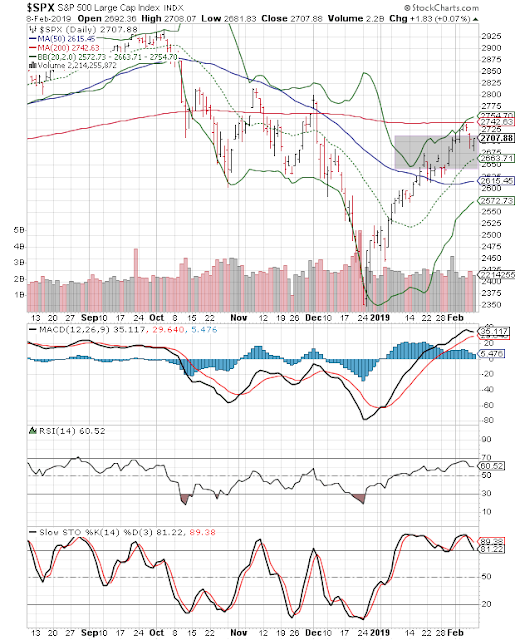 Strong resistance from the falling 200 day EMA prevented further upward progress. Bears stepped in to ‘sell on rise’. The index closed below 7100 for the week, but gained 0.7% on a weekly closing basis. Daily technical indicators are correcting overbought conditions. MACD is above its signal line in bullish zone, but has stopped rising. RSI has turned down after facing resistance from the edge of its overbought zone. Stochastic has dropped down from its overbought zone. On longer term weekly chart (not shown), the index faced strong resistance from its 50 week EMA and dropped down to close below 7100, but stayed above its 20 week and 200 week EMAs in long-term bull territory. Weekly technical indicators are looking bullish. MACD is rising above its signal line in bearish zone. RSI is about to cross above its 50% level. Stochastic has entered its overbought zone.